Whether you live in New York or just like to visit, the images of the city are spectacular for any decor. With the serenity of Central Park and the bright lights of Times Square you are sure to find the perfect New York Art for your home, office or dorm at Big Apple Posters. New York Skyline pictures are available in black and white and color photography, and the bright lights of the city will add to any decor style. With one of the most captivating skylines in America, framed New York City prints and posters make a great souvenir of your trip to the city. Be sure to take a look at the beautiful panoramic New York City prints by Jerry Driendl. Brooklyn Bridge posters make great gifts, are beautiful framed and are perfect for those that love New York or just great architecture. 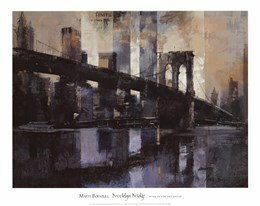 With the great selection of Brooklyn Bridge posters we offer, you will find something for every decor. From black and white images to color pictures the many artists in this category capture the beauty of the Brooklyn Bridge in many awe-inspiring ways. Statue of Liberty posters is a great way to remember a visit to the Statue, and also an elegant way to show your patriotism in your home or office decor. Display in your home a poster of one of the most recognized symbols of freedom. 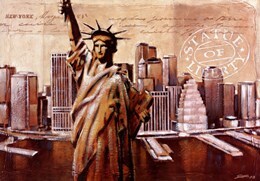 Statue of Liberty posters make a great gift for foreign exchange students, new citizens of America or Veterans. New York Yankees posters are just the beginning of prints and posters available for New York sports teams. The Mets, Knicks, Giants and Rangers also have many team and player prints available for home and bar decor. World Trade Center pictures have a special significance to many Americans and there are many images available to help capture this part of the New York skyline that will never be seen the same again. New York City Paintings are some of the most popular New York City images and it's no surprise with the all the breathtaking views that this amazing city has to offer. © BigApplePosters.com. All rights reserved.